1835. Feb 11th – Foundation stone laid by Frances Anne, Marchioness of Londonderry. 1865 – Frances Anne, Marchioness of Londonderry died at Seaham hall. A stained-glass window was erected in St. Johns in her memory. 1907 – Harrison & Harrison organ donated by the 6th Marquis of Londonderry, in memory of his parents. 1915 – Rev. Jas. Colling became Hon. Canon of Durham Cathedral. 1929 Nov – A chime of eight bells installed at St. Johns to commemorate the centenary of the town of Seaham Harbour. 1932 Nov – A quickly built asbestos construction was provided for the people of Deneside as a combined church, hall and Sunday School, it was opened on All Saints Day and dedicated by the Bishop of Durham. It became known as ‘The Mission’. 1940 – Rev. Appleton was moved to Chester-le-Street and Rev. Oswald Noel Gwilliam was installed as Vicar of Seaham. 1943 May 16th – A huge landmine destroyed 113 houses and a methodist church only 200 yards from St. Johns. It killed 37 men, women and children and more than 1000 properties were damaged. Every window in St. Johns was blown out, except the Frances Anne Memorial Window. 1948 April – Rev. Gwilliam accepted the position as Rector of Houghton-le-Spring and Rev. Norman Maddison was inducted. 1953 – All stained-glass windows replaced following the explosion in 1943. 1961 – Rev. Maddison moved to Wolsingham and Rev. Vernon Roy Brain became Vicar of St Johns. 1981 March – Rev. Neil Heavisides inducted as Vicar of St. Johns. 1985 – Previously a church warden at St. Johns, Rev. Les Hood was ordained and became Curate in the parish. 1997 Nov – Canon Jobson licenced at St Saviours, Pimlico, leaving St Johns in what was to become its longest interregnum. 2007 – After a 10 year interregnum, Father Peter Twistleton was licenced as ‘Priest in Charge’ of St Johns, All Saints and St.Hild & St Helens, Dawdon. 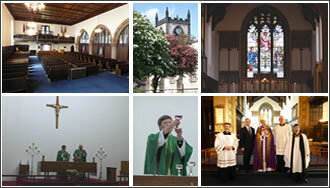 2008 Jan 1st – St Hild & St Helens, Dawdon closed and the new parish of Seaham Harbour & Dawdon was born. 2015 Nov 15 – Father Peter Twistleton retired, once again St Johns was in interregnum but this time with retired priest Father Chris Collings caring for the spiritual needs of the parish.